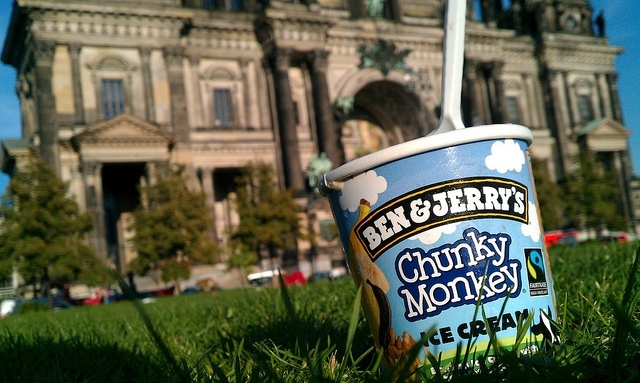 Advertisers and marketers love to praise Ben & Jerry's for its expertise in using social media. The company spends about a fifth of its marketing budget to reach 10 million "fans" who connect to its accounts on Facebook , Twitter, Snapchat and other platforms. But technology is only the tool. Ben & Jerry's keeps its fans close by speaking truth to power. Ben & Jerry's didn't do much advertising in its early years. Instead, the ice cream favorite relied on direct sampling, media coverage and word of mouth. Social media is an extension of this strategy, said Jay Curley, senior global marketing manager. "Direct relationships with fans and standing up for the values we believe in is how the brand was built," he told TriplePundit. "When social media emerged, we were in a good position to take advantage." The company distributed over 70 "values blog posts" on its site so far this year, a 20 or 30 percent increase from 2015. The posts advocate for solutions to difficult challenges like structural racism, climate change and voter suppression. They steer readers to activism resources in ways that are optimistic and funny without soft-pedaling the problem. "We're a much more content-driven organization than we used to be," Curley said. "Storytelling is an important way for us to inspire fans and build the capacity for social change." Taking forthright stands on social issues is "our voice as a business," Curley said of the company. "It's a way for us to reach fans in a way other businesses can't." In April, co-founders Ben Cohen and Jerry Greenfield, board chair Jeff Furman, and other board members were arrested in a civil disobedience action at the U.S. Capitol in protest of voter suppression. "The media didn't want to tell the story," Curley said bluntly, "so we told it ourselves." The action generated 500 million impressions through sharing on social media, and it lead readers to other posts like a one-minute video that explains voter suppression in a pantomime with ice cream and spoons. "With Snapchat, we were able to make a narrative about what was happening in [Washington, D.C.]," Curley explained. "Twitter is for what's happening now and what others are doing. We would share tweets from the National Association for the Advancement of Colored People (NAACP), and they would share ours. Then environmental organizations like Greenpeace USA and the Sierra Club picked it up. It happens organically." CEO Jostein Solheim said digital platforms "let [Ben & Jerry's] put all the relevant information into the consumer's hand. It allows us to scale our social impact." The result is advocacy journalism that is also marketing. Recent Ben & Jerry's posts include a testimonial from NAACP President Cornell Brooks, a post entitled "8 Weird Things You Didn't Know Were Caused By Climate Change," coverage of the next frontiers in the struggle for LGBTQ rights, and a somber report on the bleaching of the Great Barrier Reef. A particularly tough June post on systemic racism was re-posted and circulated through July, Curley told us. It was shared widely within the racial justice movement and also picked up by several journalists. The posts barely mentioned ice cream. They didn't have to.